The purpose of this book is to present the technology requied to develop hardware and software for embedded controller systems at a fraction of the cost of traditional methods. Included in the book are hardware schematics of 8051 family development systems (single board and bussed 8051 microcontroller). 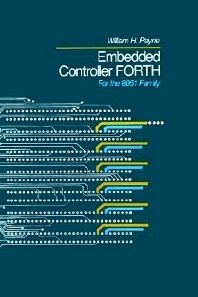 Source code for both the 8086 and 805 family FORTH operating systems is published in the book. Binary images of the opeating systems can be generated from teh source code using the metacompiler also contained in the book. The book can be seen as a "toolbox" includingg all the necessary hardware and software information to be used in constructing 8051-based controller systems. The FORTH Embedded Controller Hardware/Software Development Strategy. 8051 Family Hardware Systems Schematics. The IBM PC Compatible Four File FORTH Operating System. 8051 FORTH Assembler Programming. Reverse Software Engineering Asembler Code. The 8051 Family FORTH Operating System. The Nautilus Version 2 Metacomplier. FORTH Decompilers. Porting FORTH to Another FORTH Version or Processor. Appendices: Source Listing of the 8086 Family FORTH Nucleus. ASCII Listing of the Binary Fo FORTH86. Nonassembler Version Fo the Laxen Full Screen FORTH Editor. Assembler Enhanced Version of Laxen's Full Screen Editor. PC/ASSEMBLER 8086, 8087 and NEC V30 Family FORTH Assembler. "Examples" Syntax Tables for the 8051 FORTH Assembler. 8051 FORTH Operating System with Romed Assembler and Mini-Full Screen Editor. ASCII Listing the 8051 FORTH Operating System. Symbol Map of the Binary of the FORTH 8051 Forth Operating System PC Terminal and Disk Emulator. Nautilus 2 Metacompiler Base. The Nautilus Version 2 Metacompiler. The 8086 Family Metaassembler. 8051 FORTH Metaassembler. The DIS FORTH Decomplier. The SEE FORTH Decompiler.